Are Water Powered Cars Real? This month's newsletter is about hydrogen powered cars or more simply, water powered cars. And just to be clear, I am not talking about those "hydro boost" things - those do not work and are 100% scams. T hose claiming that they do work are simply dishonest scammers who want to steal your money. If you don't believe me or MythBusters then maybe you'll believe the more recent Popular Mechanics and Dateline tests. Also... I am not talking about fuel cells either. What this newsletter is about is running an internal combustion engine only on a mixture of hydrogen and oxygen. And the water electrolysis is done totally on-board. In other words, the power to split the water into hydrogen and oxygen is derived from the same engine that is running on that hydrogen. 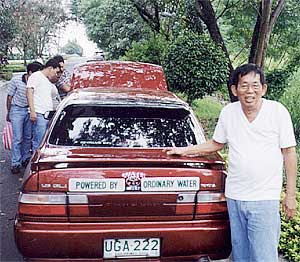 A true water powered car. I know! I know! That's supposed to be impossible - right? Well... maybe not. And I'll be the first one to admit that I am not an expert in electronics and I couldn't build a electrolyzer if I had to. But I have seen and read enough about water powered cars to believe that it can be done. I believe that certain people like Daniel Dingel in the Philippines and Stanley Meyers have actually done it. The secret may lie in applying the voltage at just the right resonant frequency to break apart the water molecules easier. Also, there seems to be greater efficiency at lower voltages below 1.47 v. At lower voltages, the process becomes endothermic (absorbs heat) instead of an inefficient exothermic (gives off heat) process. It is interesting to note that Stanley Meyers split water using high voltage and low current. His electrolysis units were said to also run cold also. This is in opposition to traditional methods to split water which use high currents and thus more energy. His theory is that voltage can do work.